Once upon a time, in the cooler zones of the West, wild fruit was the only fruit available to the homesteader. Late summer and early fall were berry picking time. Settlers scoured bog, flat land and hillside for the prized berries. No matter where they lived fruit was sure to be handy. Today, when most land is cleared and cultivated, it's difficult to imagine the variety and abundance of accessible food then. There were saskatoons, plump and delicious, especially on the prairies; strawberries so tiny they were a nuisance to pick in quantity, but with a sweet flavour never equaled by any domestic species; tall raspberries, blueberries, the mainstay of the winter's fruit and several types of cranberries. Low-growing, mealy ones were common; rarer, more easily picked high-bush berries made a tangy, clear jelly, and bog cranberries, the sort now grown by the cranberry industry. And, of course, the scrumptious mountain huckleberries. Like the indigenous people before them the settlers knew their surrounding berry patches as well as any bear. In fact they might find themselves sharing a blue-berry patch or saskatoon tree with a hungry bruin determined to stuff in as much of the delicious food as possible before denning. Berry picking was an important part of our childhood combining the pleasure of a drive, the fun of a picnic and the thrill of exploration. We viewed these excursions with eager anticipation. The actual picking was of secondary interest to us, but not to our parents who were mentally tallying the jars of fruit to be put in the root cellar. In later years going to the garden to harvest tame raspberries and strawberries wasn't half as exciting. It was no picnic; it was just plain work. And, you still had to contend with bears and bugs. When picking wild berries, first you had to find your berry patch. Some were commonly known. A year or two after a fire, the burnt area would have a prolific crop of blueberries. Most of the community could be found there, stripping the bushes. But, people had their own special spots which they kept secret even from close friends. "Been finding any lately, George?" someone would ask. "No, not much this year. Hear there might be good picking down the Canoe, though. ", replied Father, carefully misdirecting the questioner. Methods of picking were strongly debated. Was it better to take time to cleanly remove each berry or to go rapidly through a patch, gathering the inevitable leaves and twigs, only to spend hours taking them out at home? There was constant tension between the hasty and the meticulous. Sometimes haste was necessary. Our Father invented a scoop for gathering bog cranberries; a curved box with metal teeth which were pushed through the plants. It collected a vast number of leaves and lichen, but, to the person standing ankle deep in water, the quicker it was done, the better. Sorting and cleaning could take place at home, away from persistent mosquitoes and black flies. Berry picking gave deep insights into people's basic characters. There were contented ones like our Mother who, once she'd found a good patch, stayed there picking till it was done, versus the restless wanderers like Father. He'd come west from Ontario, looking for gold. The gold pan was long ago hung on the wall. He was a settled man with a family. But, every berry picking season, the old dream of a land of riches; well, rich with blueberries, anyway; asserted itself. We'd hear the clank of his pail against the trees as he muttered about a better patch, just over the hill. Hours would pass before he reappeared with a bucket of what he insisted were bigger, better, berries. We never could convince him they were the same size as the ones we'd been picking. Father wouldn't abandon his vision of finding a gold strike or vein. Sorties to get berries would be interrupted by a loud cry followed by a jamming on of brakes as his prospector's eye spotted a likely looking rock. 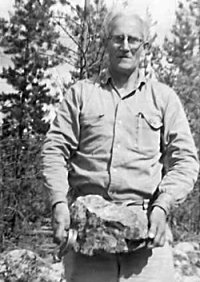 He carried his rock hammer and sacks for rock samples in the tool box, right beside the pliers and wrenches. He never did find the mother lode, but the berries panned out well. In the last grim years of the Depression he made extra money selling them either to the store-keeper at Red Pass or to the Hudson's Bay Company. 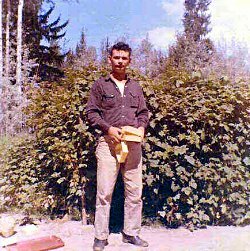 In a 1938 letter to Mother, then his intended bride, in Winnipeg, he rationalized staying in Valemount and combining prospecting with berry picking rather than going to the prairies harvesting. Although harvesting was a sure thing, he could make almost as money selling berries. And, there was that hope of a strike. Not only did we sell berries; we traded them. Friends in Kamloops, a zone 5 paradise of such exotic produce as cucumbers, tomatoes and McIntosh apples, were all too pleased to have wild fruit. I never learned how many pounds of huckleberries equaled what weight of tomatoes but the trade continued for many years to everyone's satisfaction. As decades passed there seemed to be less and less time to hunt for the perfect patch of berries. It was so much easier to plant strawberries and raspberries and just walk down to the garden to see if they were ripe. But, we still yearned for those wild blueberries and huckleberries. The last time we went searching for huckleberries it was a scorching August day. Father and I left Mother and my son, Kurt in the car at the end of the mountain road. Every window was tightly closed to keep out hordes of hungry mosquitoes. We slogged through shoulder high devil's club and slide alder. At the end of three steamy, bug bitten hours, we had found one huckleberry. It was the end of an era for us. But, people in that area still monitor the good berry patches and compete with bears for blueberries. If they're very, very lucky, they may even find more than one huckleberry.